There is finally a show worthy of the Diller, Scofidio and Renfro building which houses the Institute of Contemporary Art in Boston. 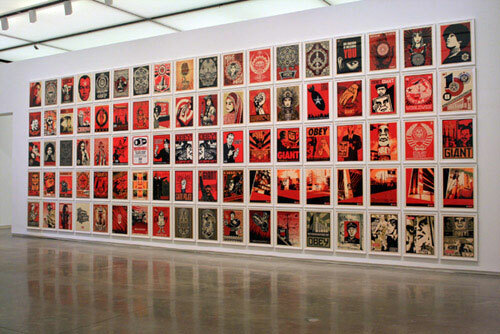 Shepard Fairey: Supply and Demand opened February 6th and is on view through August 16th at the ICA. The show started with a bang as Fairey managed to get himself arrested on the way to the opening on outstanding warrants. Many guests who had paid up to $500 for tickets to the opening on Craig’s List were disappointed, but this was not a new experience for Fairey… as a street artist he claims to have been arrested 14 times. Apparently it wasn’t the media event the Boston Police hoped for because Fairey’s cab missed the main entrance and his arrest happened at a side entrance rather than in front of a crowd, but it none-the-less reminded us that Fairey made his name “bombing” (to paint, sticker or post many surfaces in an area)… a less than legal practice. As I wrote about in New Beginnings, Fairey is perhaps best know for his iconic “Hope” image used by the Obama campaign, but this is only one small part of this extensive exhibit covering 20 years of work. 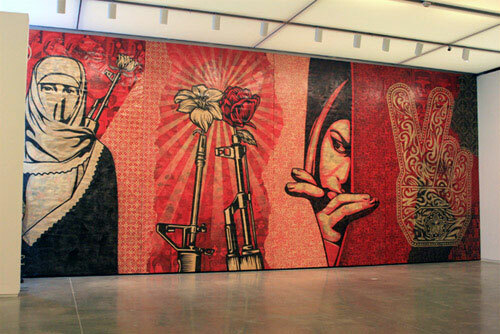 The show includes murals, screen prints, collages and other media covering a subject range from Andre the Giant to anti-war propaganda to rap artists, rock stars, and political figures. One thing is clear… this guy works hard. The quality and amount of work he has created in a short period of time is prolific. As a graphic designer I am drawn to this exhibit for its bold visual appeal. The consistency of style and mostly red, black and white palette (dictated by working with only 2 toner cartridges early on) gives his work an overall unity. I particularly love the juxtaposition of Fairey’s bold images with the exquisite detail you see when you see these works up close. What seems to be a “red” area is actually made up of a layers of newsprint collage. The attention to detail and craftsmanship is exquisite… not something you would expect from someone who by necessity “installs” his work with speed and stealth. Repetition is also a key element of Fairey’s art. The same images are used over and over again throughout the show in different way. This builds to a crescendo in the final rooms of the show where we are greeted with a huge wall of identically-sized prints incorporating graphics seen throughout the exhibit. On either side is a large single mural covering most of the wall — a single bold image incorporating layers of graphics in one piece… pretty amazing. Fairey’s work challenged our notion of “art”, The recent AP legal battle over the photograph used by Fairey to create the Hope poster will have implications for future artists. Jason Pollock writes a great piece in the Huffington Post comparing transformational figures Obama and Fairey in politics and art and how both have pushed boundaries. Don’t miss this exhibit. It is bold, fun and challenging all at once. Not bad for the price of admission. This video shows Fairey at work and discusses the creation of Obama Hope image. sweet article … i didnt realize fairey was such a little rebel with the police. hope i can make one of his shows sometime …cause his artwork seriously roxx!